I first tried lentils last winter with the sausage and lentil soup, and I've been enjoying them ever since - in salads, as one-pot meals with veggies and a protein, and most recently, in vegetarian pot pies! I've always been intrigued by red lentils because as fickle as it sounds, I think they are so pretty! However, they cook faster than green or brown lentils, which makes them a poor choice for salads - they get mushy and lose all texture. This is what makes them ideal for soups, as they kind of "melt" into the broth and thicken the soup. I was really intrigued by this recipe as I read In the Kitchen with a Good Appetite. I had never thought to pair lemon with lentils, but it makes perfect sense - lentils are earthy, and the bright acidity of lemon is a perfect match. After I read this recipe, I couldn't get this soup out of my head, and I NEEDED it as soon as possible. Which led to me on a wild goose chase to four grocery stores looking for red lentils. I did eventually find them, and as I drove home, I thought to myself that "this soup had better be good." And boy, was it! It is flavored with tomato paste, cumin, chili powder, and garlic, and then finished with cilantro and lemon. It is comforting and earthy, with a nice freshness from the lemon, and a spicy kick at the finish. I served this with toasted pita, which was perfect for dipping. I'm submitting this post to Branny's Charity Souper Bowl blogging event - she is making a contribution to the ASPCA for every soup entry through February 6th. Though we don't have any pets, I absolutely support this endeavor and this charity. Thanks, Branny! Heat the oil in a large pot over high heat until shimmering. Add the onions and saute until golden brown, about 4 minutes. Stir in the garlic, tomato paste, cumin, chili powder, cayenne, salt, and pepper. Saute an additional 2 minutes. Add the broth, 2 cups water, the lentils, and the carrots. Bring to a simmer, then partially cover the pot and reduce the heat to medium-low. Simmer until the lentils are soft and breaking down, 30 minutes. Taste and add more salt if necessary. Use an immersion blender to puree the soup to acheive a chunky consistency (or transfer half to a blender or food processor, puree, and return to the pot). Stir in the lemon juice and cilantro. Serve the soup drizzled with olive oil and additional lemon slices. Dust lightly with chili powder, if desired. The first time I ran into red lentils was at the Dekalb Farmer's Market in Atlanta. I came home with a pint of them (and "home" is in another state) and have never again seen them in stores. This soup looks great - I'm sure I'll remember to make it after I pick up some lentils in Atlanta in May (when I've there for BlogHer Food!). Does your supermarket have an ethnic section? At my grocery store they are with the middle eastern/greek foods, right next to the Kalamata olives. Thanks for sharing this recipe. I love all kinds of lentils, and I bet the lentil-lemon pairing is really fabulous. Oh my lthis ingredient list is fabulous and I have never tried anything like it. I have to add this to my weekly list. I love red lentils and I love soup! Lately I've been making TONS of soups and chilis because it's been so cold, so I will definitely be trying this one soon (I will post about it as soon as I do!). I love the idea of adding lemon to it -- I'm sure it really brightens up the flavors, too. This looks amazing! I was linked to your blog through another and I'm so happy I clicked through.. I too am a lentil fan, I just posted my lentil tacos (http://thewibigreddoor.blogspot.com/search/label/Lentils) last week! Cannot wait to try this soup! Yum - we are on the same page! 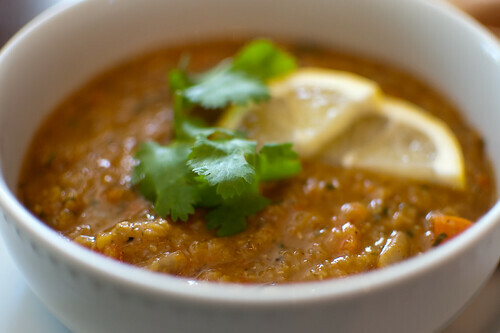 I recently made lentil soup, a curried green lentil version that was delish. This soup was amazing. I can't wait to eat the leftovers tomorrow! Healthy, inexpensive and delicious.